The "name" text area is not editable. You can change checkbox and drop down menu for icon click, but the "save" is always grayed out (therefore, can't actually modify). Did I miss something obvious? See the FAQ on this topic. If you want to change a default action, you can make a copy to edit (and you can disable the default, if you wish). I think I may consider adding a link/button to clone the action directly from that dialog, so it's a little more discoverable. Oh thanks, that makes sense. Maybe it could be more intuitive to just hide the gear icons for default actions? Also, I encountered a problem: I overrides the default "click" operation with a custom action, now I can't find a way to put it back to "GeoTool" (I knew I can just copy it and use my copy to have the "click", but as you said in FAQ, this way I can't get the "official" update for this action automatically any more). 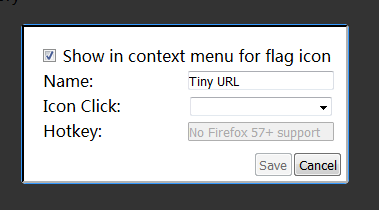 The gear icon exists to let you configure the hotclick and hotkey, the latter of which is unfortunately not supported at all by the now-mandatory WebExtension API, so I had to drop support for Firefox 57+. (the API only allows preset hotkeys, not any user-configuration of any kind) You can still set the hotclick though, which is what you're asking in the second part of your reply. Just click the gear icon for Geotool in the options (or doubleclick it) and set "Icon Click" to "Click" via the dropdown menu. I can't seem to be able to set it. Should I just "cancel" after selecting an icon click? Because as mentioned before, I can't click save as it's greyed out. Thanks for the screencap and sorry for not realizing there were two issues here, earlier. The inability to change the default action names & templates is intentional, but the save button is still supposed to work for saving the hotclick. It being greyed out is a bug in Flagfox 6.0.0, which I've now fixed for 6.0.1. There was also another bug here causing saved custom action hotclicks to not show in the edit dialog, which I've also fixed. Apparently, I didn't test this enough and nobody else noticed it in the beta. Sorry about that; the fixes will be in the next update, which should be available within the next few days. Thanks for reporting the issues. Great, thanks for all the hard work!